How much interest you can earn from bank term deposits? This free term deposit calculator will show you how much interest you can get from a fixed term deposit. In addition, you can use this calculator to compare bank term deposits with different term deposit interest rates and terms to see which is the best term deposit. For example, a Westpac 3 months 8% interest rate term deposit or an ANZ 1 year 6.8% interest rate term deposit. This term deposit calculator also shows you how much interest the same amount money can earn under different term deposit interest rates and deposit terms, for example, 3, 6, 9 months or 1 to 8 years. You can change the interest rate, money to deposit, and how long you want to deposit with the banks. 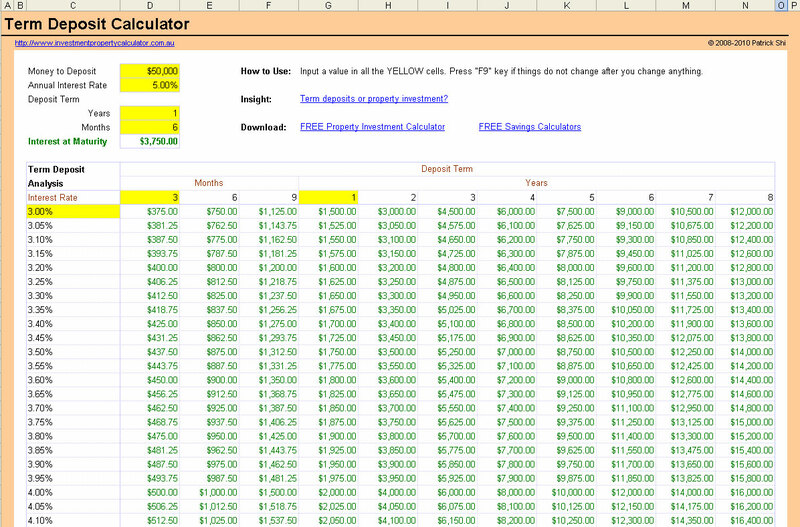 Here is a screen shot that will give you a better idea that what you need to do and what this free Term Deposit Calculator can tell you. 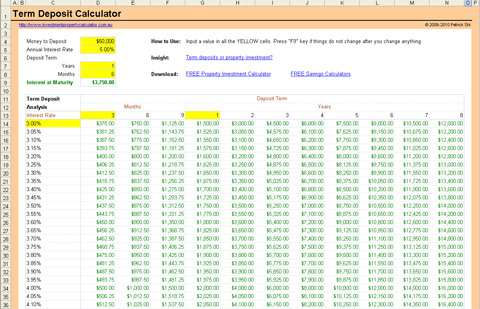 Download FREE Term Deposit Calculator Now! Do you ever have to choose between term deposit and property investment? With the term deposit calculator and the Free Investment Property Calculator, you can make an informed decision.